"The poems in this volume", writes Tom Lowenstein in his introduction, "have all emerged from ethnographic work in Northwest Alaska and come from three separate periods of writing spread over thirty years". In 1993 Bloomsbury published Lowenstein's "Ancient Land: Sacred Whale". Subtitled "The Inuit Hunt and Its Rituals" this account of Eskimo life on the Peninsula of Tikiraq in Alaska focussing on the traditional whale hunt was narrated largely in verse, interspersed with prose sections giving background material. At the time, it attracted some very favourable reviews, in the London Review of Books and elsewhere. But one is struck by the fact that it was reviewed by critics who by and large, did not otherwise write about poetry, and in the poetry magazines the book went largely unacknowledged. It is not as if Lowenstein didn't have a track record. His first book publication had been a collection of translations of Eskimo poetry, made from the versions of the Danish originally collected by Rassmussen; this appeared from Allison and Busby in 1973 at about the same time as his fieldwork in Alaska was getting under way. The first collection of his own poetry to appear, "The Death of Mrs Owl", came out from Anvil in 1977, and in 1978 The Many Press (and here, as the press's founder perhaps I should declare an interest) brought out "Filibustering in Samsara". It is as if, when the Bloomsbury book appeared, people where not quite sure where to place these texts. In "Ancestors and Species" Lowenstein has made a collection of material on this theme that combines a generous selection from "Ancient Land: Sacred Whale" and three passages from "Filibustering in Samsara" with a substantial amount of uncollected work. There is that sense of sudden and miraculous encounter one finds in Rasmussen, which seems to me to be common both to the texture of the social life and to myth. There is too a constant return to themes of ecstatic dissolution and reconstitution, anchored in the detail of spirit-possession and shamanistic vocation..."
Suddenly you realise that the young man standing near to you is a shaman. "Irigii! Angatkuq ilvin! (You're a shaman. I am frightened!)" contraption of the entire grammar, ablaze with its connective logic. The young angatkuq tands gazing at the plovers. "up there cheeping in the broad heaven?" leaving his skin with us. in the knowledge that I would discover them". their spears are made of the narwhal horn, and they are the last of the Men!" "Inupiaq, Yup'ik, Gwitchin, Koyukuk, Tlingit, Ingalik, Aleutic. Most of Alaska's natives, Eskimo and Indian, are represented here, living out their final days in virtual silence. Stranded in their rooms and in front of the TV, the old folk sit, in thrift-store shirts and trousers, like a patchwork map of tribes from a country the size of France and Scandinavia, and whose people, in their far-flung river and coastal villages, seldom meet each other except when they come to be cured of white men's diseases, or to die in comfort and isolation." I call his name and Asatchaq half-rises, casts around for his slippers and adjusts his watch-strap. Then, straight-backed and in quizzical anticipation, he recruits his awareness and extends a muscular right hand which grips mine softly. I think later of the work this hand has accomplished. The tons of meat, blood and fat it has harpooned, lifted, hauled, skinned and butchered. the nets and rifles, slings, snares, lashings, dogs and skin boats it has engaged with. The drummings, dances, rituals, sexual escapades it has engaged with. Now yielding and domesticated, this Inupiaq hand meets its would-be ethnographer." "All this is obscure and untidy. What Inupiaq I've learned comes quickly unravelled. Asatchaq's talk is involuted. I shift, sweat, stammer questions. Asatchaq is very disappointed. He knows how little I understand. He withdraws with a mean-looking sneer, returns half-heartedly, then drifts into silence. 'You should listen', he growls, 'then you'll learn the story'." "My attempt in this regard was to make lines that spoke and enacted the construction of artefacts which in themselves were composite. A harpoon, for example, the most complicated of the Inuit hand-held weapons, consisted of a variable selection of animal parts (bone, antler, sinew, ivory, skin line, baleen) with a stone point at one extreme and a driftwood pole at the other. The connective/disconnective process of deploying this (it disassembled on impact) was an aspect of what all hunting weapons were built to achieve. Propelled through space, it brought, through a process of extension and contraction, the animal body towards people, who then consumed it, in part to repeat the process." 'Put on your mask then', the umialik mutters. The mask-holes eat at his eyes and cheekbones. The harpooner turns away. 'We need that man's paddle. I'll kill him if he stays out shamanising. Then 'Come back!' he shouts, and lifts his weapon. The flukes on the whale-maske flap and go under. Yai! from the stern umialik counters. 'All right!' he agrees. 'Seven paddles might do it.'" 'What sort?' I considered. Not personal history, character, motivation. She means 'kind' or 'species': my range, behaviour, patterns of feeding. How I would mate. My migratory habits. The children's visits went on through the six weeks before whaling. at the downstairs window and one day broke it. and we'd have nappy crises. alive, aloof, and curiously peopled. but then abruptly gone in atmospheric summer shimmer. "An ice-cream van painted with flaring utopian iconography stand in the car-port outside the nursing home. Planets, UFOs and Third Eyes float in a pradise of Himalayan temple-gardens. Wise-man and female nature-spirits sprawl in the foliage round the driver's window where a bearded young man in army fatigues sits reading Zap Comix and smoking a Camel. Lured to the scen by Schuman's Traumerei, a girl limps through the swing doors, buys and ice, requests a cigarette, lights up and retreats. The ice-cream music switches to a lullaby by Brahms and the van drifts away towards the river." "'Never heard of it', she said. 'and young man, I can assure you, they don't have a language. ...Some smart-assed professor’s made those words up. "At the end of the telling, the six girls got up and left the cabin. But Inuit don't say goodbye. They just walked off into the silence." 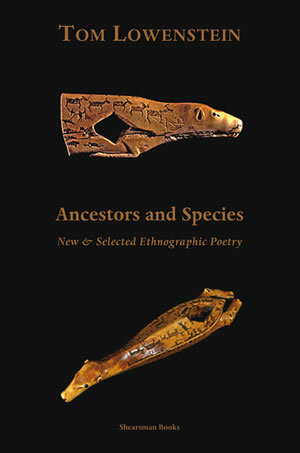 I'm still not sure how to place 'Ancestors and Species' in the context of contemporary poetry and its processes, or where work such as this might lead with its remarkable fusion of original ethnographic research and poetic powers. But there's nothing else out there quite like it. Acknowledgement: this review first appeared in Tears in the Fence magazine.